Has anyone seen any speed increases on the Iphone 4 or 4s on 3G? When I first got my iphone my Photon and 4s were both pulling down about 100-300K on download now all of sudden they are both pulling about 1-1.5M download. Is Sprint already rolling out the 3G network upgrades or is my area just getting lucky with people actually putting their phones down? No improvement north of Charleston SC. 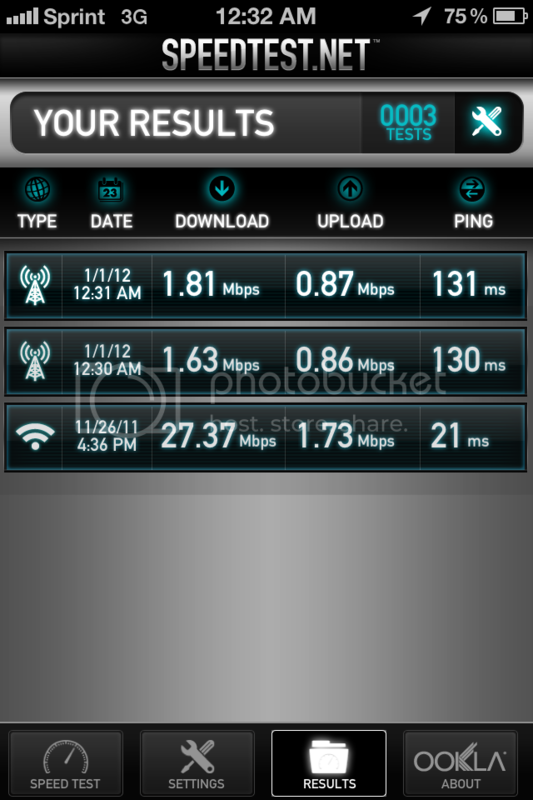 No improved speeds on my friends Sprint 4S in the Philly area. She doesn't care about the speed, though, as she is happy to finally have an iPhone on Sprint. in San Diego, its spotty....i'm usually encountering ~0.4 Mpbs, but there are some spots [my work, and my home] where i get 1.1-1.5 Mbps. 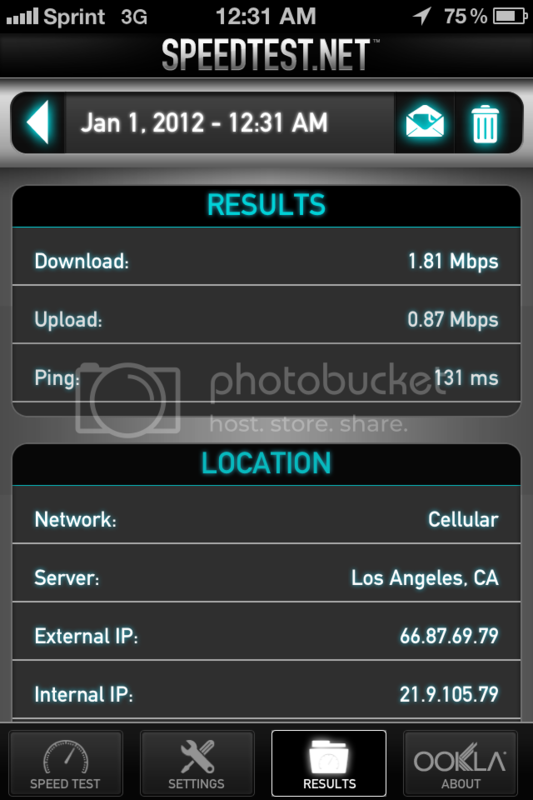 My 3G speeds are much faster than any other network with Sprint. @ariell...I wouldn't hold your breath. Actually, if you go to Sprint.com and look at they're coverage maps and input your zip code, it will show any updates that have been done to towers and newer updates that are coming. The 3G at my job is decent, could be faster, but the coverage map showed me they will be updating the speeds in my work area within the next 6 months. Where does it tell you that on the website? I don't see it. When you go to to the coverage maps, you should see it on the actual map itself when you input the zip code of you're area. I just checked myself right now, and I pulled it up no problems at all. My speeds were horrible. I was out of contract and got my iPhone from Craigslist not wanting to sign another contract. My data speeds were HORRIBLE! I was getting .25-.60 at the very most. And .1 on the upload. I couldn't take it and left Sprint for At&t this week. I'm getting 4-6 down all the time. I see a lot of people talking about 4S speeds on Sprint. I will say I was avoiding snagging any iPhones on Sprint because of this. I am in charge of all our mobile phones at work. We finally decided to bring one in for testing to see how it did with our network and since we use Sprint for cell, data and Nextel. I am in the Seattle area. I work downtown and live in Lynnwood (20mi or so north of Seattle). I haven't had any issues with my 3G speeds. They are on par with my other Sprint 3G phones (EVO 4G, EVO Design 4G, EVO 3D, Arrive, Pre, Intrepid, and Ace. Yes these are on me all day every day), both in downtown Seattle as well as at home. Even kept the same speeds while in Portland a couple weeks ago. If I have slow data speeds on the iPhone I get the same speeds on my other phones. So it is all about where you live like with any cell phone. I also have an original iPhone on T-Mobile (EDGE) that can be hit or miss as well as an iPad on AT&T. 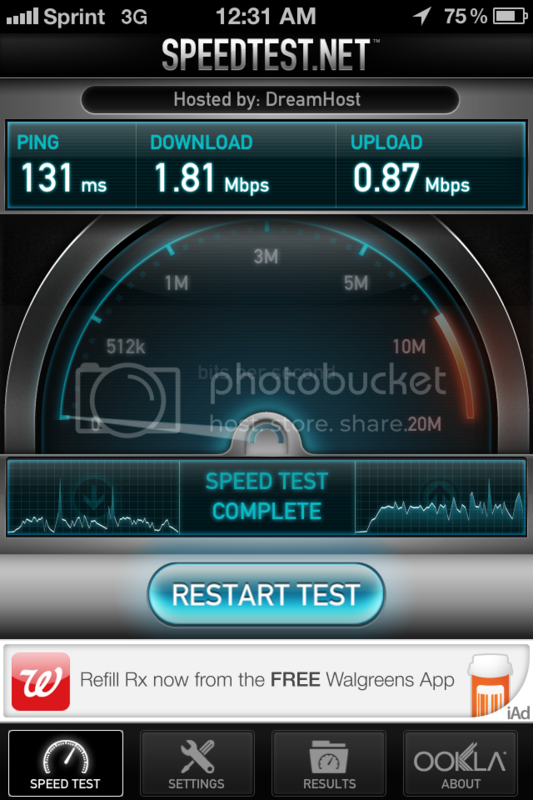 While AT&T gives overall faster speeds, I have had more consistent speeds and connection while using the Sprint 4S. Both 3G and 4G (WiMax/Clear). Speeds averaged about 1.50Mbps down and 1Mbps up. Peaking around 2Mbps. I was just about to ask people about this. I'm down in the Tampa area and tried today. Got around 2.25 down. I was shocked. Just pulled down a solid 0.06 Mbps down and 0.00 up in Houston. At least I can make phone calls, unlike with AT&T here.